This report will be repeated in the New Year’s Eve 2017 edition of Taste Wolverhampton. In February, my wife and I spent a couple of weeks staying with friends who moved to work in Florida a few years ago. They live in Kissimmee (pronounced Kiss-emmy locally) which is within 15 minutes of all the Disney theme parks. There are family-friendly fast food places everywhere, and there’s nothing wrong with that. But if you fancy something a bit special or eating and drinking somewhere that’s perhaps run by a family and not part of a national chain, where do you go? The last couple of trips, I’ve had a look at Trip Advisor, and that’s taken me to great authentic Mexican restaurant just out of Kissimmee, but not much else. So this trip, I decided to pack my recording gear and do some serious research on where to eat and where to drink before we left. Previously I’ve visited a couple of wineries and tasted the local wine … which, to be honest, is poor stuff. But there’s a tradition of making fruit wines in Florida, so I decided to track down a couple of specialists. I found there’s quarterly magazine called Edible Orlando which supports local artisan foodies: both makers and eaters. We’ll hear from the publisher in the second hour of the programme. If Florida isn’t the best part of America to taste local wine … and it isn’t … then the alcoholic drink they are really good at is beer. We’re going to hear from two craft brewers today: John Cheek from Orlando Brewing, who’s an established and experienced brewer, and Jared Zakerowsy from the Crooked Can Brewery that’s barely two year’s old. 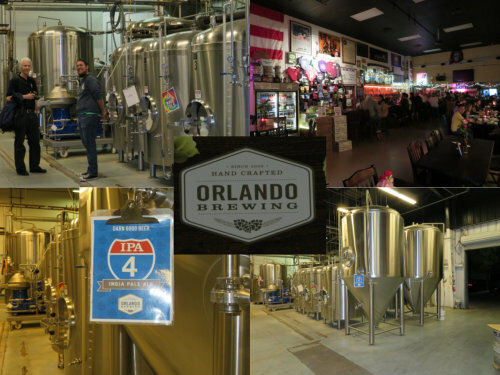 They’re both producing fabulous beer in a great variety of styles, so let’s start in Orlando – one of the most popular holiday destinations for British tourists. Most head for the theme parks, but lots of breweries in the States offer both free brewery tours and entertainment at their bars through the afternoon and evening. So, let’s head to a business and industrial area close to central Orlando. 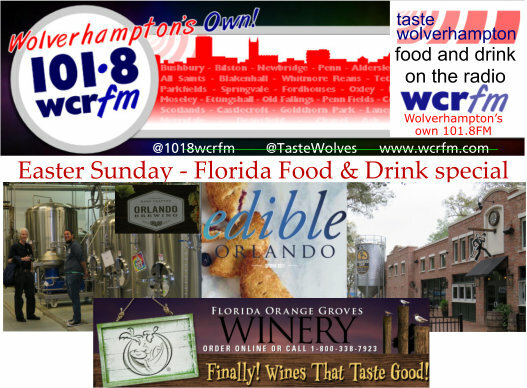 And if you’d like to read more about Orlando brewing or, if you’re heading to Florida this summer, check out the entertainment evenings on the website: www.orlandobrewing.com. I don’t think it’s unfair to say the wine-buying American public is generally less knowledgeable than in the UK. Maybe because the UK vineyards have established their credentials so recently compared to the rest of the world, our supermarkets really got their acts together from the 1970s onwards importing good wine. Also, we never had Prohibition. In Florida … I was trying to find a Californian Zinfandel in one big supermarket, which was made harder because the wines were in alphabetical order of whatever the biggest word is on the label. Very odd. We found a huge wine warehouse in Orlando open to the public that is hugely impressive (totalwine.com): lots of European wines, a lot of American wines, and 2 narrow shelves of Florida wines. Sad but a sensible decision, because only the Muscadine grape can grow in Florida, and its wine tastes like dentist mouth rinse. 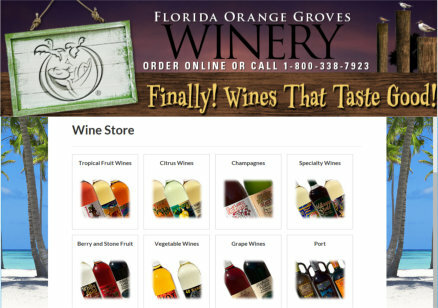 However, because so much fruit grows in Florida, particularly citrus fruit, there are now many producers of fruit wines. But buyer beware … most of those I’ve tried are very sweet and very poorly made. Do go to a tasting if you can, because the locals love a sweet wine … maybe because so much of what they eat is sweeter than we are used to. 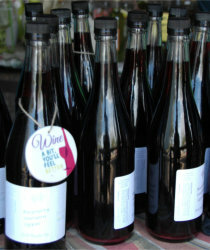 A lot of the wines you’ll see being sold in roadside stores use wine made from the local Muscadine grape with a little fruit juice added. However, in a lovely place called St Petersburg, a couple of hours drive from Orlando, they make fruit wine just from the named fruit. This does make it a bit expensive; but there again, I saw their wine being sold by an orange grower near Kissimmee alongside some they made themselves diluted with grape juice, all sold at the same price. So check the label and taste a sample if you can before parting with dollars. Let’s get an insight into all aspects of the Florida wine business from Vincent Shuck from the Florida Fruit Wines company. 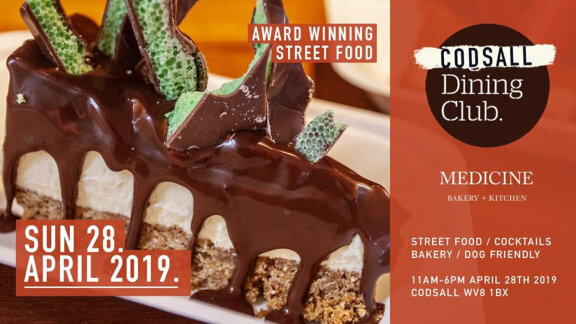 While Trip Adviser must reflect what people write most about, there are other websites and publications that aim to list Florida foodie events and uncover great local producers. One such source is Edible Orlando magazine and website, which is part of a nationwide network of food and drink publications. 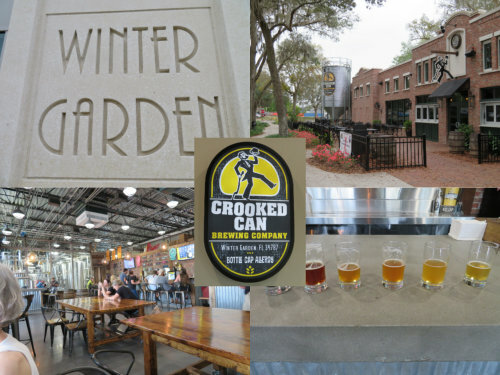 For the final Florida interview, recorded in February, I found a new brewery in a lovely town called Winter Garden. Plant Street Market is a building full of character that houses some fine products, people to cook them for you, tables to eat at, and a brewery to provide a remarkable range of beers to wash the food down with. I’d happily move to Winter Garden. I spoke with Jared Czachorowski from the Crooked Can Brewery.